Making of a KingsIsle CGI Commercial! We have a treat for you today! Fred Howard, Vice President of Marketing, is a huge part of bringing the Wizard101 and Pirate101 TV commercials to life. He’s taken some time to share a behind the scenes look at making a commercial in today’s part I of a two-part blog series. Similar to when we create new content for our games, our commercials first start with a story. Basically, “What are we trying to convey or message with the TV spot?” It is more challenging than it may seem as there are only 30 seconds to tell the story. It’s really more like 25 seconds when we account for the opening and closing logo sequence. This is a very iterative process. We go from a high concept of the message to a detailed script written out with descriptions of the scenes, character voice lines, AVO (Announcer Voice Over – voice acting for things like the ESRB rating, our website, etc.) and other necessary details needed to execute making the commercial. Once this is done, we work with our concept artists to create story boards. These are still image drawings that show detail for each step in the commercial. As with the script, this process goes through a lot of iterations to ensure we have the right look and feel in the commercial. With the completion of the story boards, we move into the actual production. The first thing we have to do is build out all of the characters, props (like boats, equipment, etc.) and locations in very high resolution. This process starts with a bunch of concept art and the in-game characters to drive the development. Our goal is to stay close to the actual game play look but to take it to the next level given we have the output opportunity of High Definition TVs. 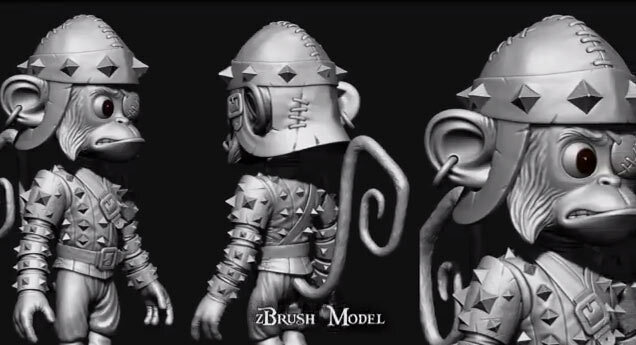 The first piece of the characters being created is called a Brush Model. These are grey scale characters built out with all the details they will have in the final commercial. Once these are done, the characters are moved to texturing and shading. This is where all of the color and depth is added — things like making a leather vest look “leather”. As the characters and props are getting built out, we actually are creating the “set” in the CGI world by placing all of the cameras, characters and assets. Once the set is built out far enough we start to capture footage with the cameras (even though the characters and assets are not done yet). This is called an Animatic. Many times an animatic is done with just storyboards, but we feel it is a much better process to actually use camera moves in 3D. We have to make sure that what was envisioned in the script and storyboards actually looks good when it is in 3D with the camera motion. This process also goes through much iteration as we make tweaks to the camera moves, the camera cuts, and fine tune all of the placements. The scene is then fully animated with all of the characters and movements. It sounds simple, but this is a lengthy process and difficult to really convey the emotions we are working to get across. Once this is all done, we move to adding all of the effects. This really brings the commercial “alive”. It sounds like we should be done… but there are a few critical pieces that come toward the end of the commercial’s creation. The first is the soundtrack. We have all of the music for our commercials scored specifically for that spot. Usually we have an idea of the mood/sound that we want for the spot early on in the process, but until we lock in timing of movements and camera angles it is not possible to get a finished piece. We also have our sound team put down the soundtrack – meaning all of the sound effects you hear in the commercial from cannons to wind to characters grunting (side note, I actually helped make some of the “grunt” sounds that are in the Pirate101 commercial :)). The sound portion also consists of recording the voice over and announcer voice over. You might be surprised that each line gets read sometimes 50 or 60 times (or more) until we get the one that we think really captures what we want. Once all this is put together, it gets finalized and shipped off to the various TV channels for your viewing pleasure. 🙂 One of the things I think is really interesting is how much detail goes into a CGI commercial like this. Stuff gets built that you barely see (and sometimes don’t see at all in the finished product) but that we have to get the little details right to ensure a high quality commercial. I think the video here showcases a little of that. Enjoy. Awesome video and post! I love learning about what goes on behind the scenes with Pirate101 and Wizard101. It’s really helpful for people like myself who want to work in game design. Keep making these cool articles! How long does it take to actually make the commercial, from start to finish? I remember, a few years back, the creator of “The Simpsons”, said it took about six months to put an episode together. Of course, I would think a commercial wouldn’t take that long. Of course I am never right. These take about 4 months from start until they are on TV. whoa, that’s harder than I though! nice yo you should make a wizard101 animation kind of thing dude. that is really cool! But it must have taken a long time. It turns out that the game wizard101 and pirate 101 has the best quality animation I ever saw!!!!!!!!! why not put these graphics into the game? It would be pretty hard, and then, without gameplay change, it would get more boring. Imagine a high-def move, pause, high-def move… In short, it would look nothing like these commercials. it would probably make a lot of lag. I have got to admit that was awesome! I thought it would be really boring turns out I was wrong. what Ive wondered is why the commercial doesnt look like the game play? that was so cool! I love it lol! that’s was so cool! I love it lol! I love the detail that are in these commercials!! What program do you use to animate and design? How long is the rendering process? wow …. just …. ummmm …. wow. I REALLY want to make a CGI animated music video, using my characters from both Pirate and Wizard! I love Wizard101 and Pirate101 but i ussaly play W101. Great pelican, this is so awesome! That was so awesome! Keep up with the great work. Really cool special effects. Wow….That was wonderful and so interesting. Loved it tons!! Good job Kingsisle keep up the good work!